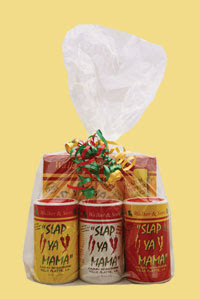 Bite and Booze is proud to team up with Slap Ya Mama Cajun Seasoning for the holidays and present you, the loyal Bite and Booze readers, with a chance to win great Slap Ya Mama gift bags! Slap Ya Mama is a Cajun seasoning company from Ville Platte, La. which produces an array of seasoning options including their original Cajun seasoning, a white pepper blend, hot sauce, fish fry, and seafood boil. 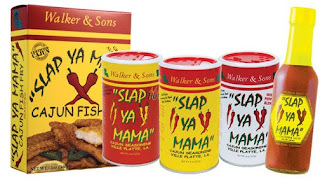 What sets Slap Ya Mama apart from other similar Cajun seasonings is that their mixture contains more red pepper and other spices that make great tasting Cajun dishes without filling the product with such high levels of sodium that leave you with over-salted food. Slap Ya Mama is "recommended for all dishes, from popcorn to seafood, breakfast to late night snacks, gourmet foods to French fries." To enter the giveaway contest, please leave a comment about your thoughts on Cajun foods in the space provided for this post. Feel free to be humorous, comment about your best Cajun meal ever, share your favorite Cajun/Creole restaurant from wherever you are from, or tell everyone how much you love Slap Ya Mama. Make sure that you leave a way for me to get in touch with you: email, twitter name, facebook profile, google account, etc. I will contact the winners to get a physical mailing address so Slap Ya Mama can ship your gift bag. Only U.S. residents are eligible (due to shipping costs) and shipments cannot go to a P.O. box. Other than that, everyone is welcome! The contest will end at midnight central time the night of Wednesday, December 16, 2009 to make sure there is time to get your gift bags shipped to you by Christmas! I couldn't find the white pepper blend at Albertson's, so hopefully I can win me some! I love Slap Ya Moma. You can use Slap Ya Moma like pepper, where you have to use Tony's like salt. With Slap Ya Moma, you don't have to worry about making something too salty if you want it spicier. It's as simple as that. Anyway, I have three favorite cajun meals. The first is simply my own homemade gumbo. It's delish. The second is the duck and sausage gumbo at the Chimes. It's just the best store-bought gumbo available. The third is the Third Row Crawfish Boil, about the fourth batch or so. That's when it starts getting just about to heaven on earth to me. This is Koubi, by the way. Slap Ya Mama is awesome on fried walleye! Oh yeah!!! Actually, I've liked it on everything I've tried it on so far. I am a Cajun boy from LA that's been living in rural Alaska for 4 years... How can I survive being away from home? Slap Ya Mama!! Thank You SYM--I've cooked all my favorites: etuffe, gumbo, jambalaya, sauce picante, and of course eggs & rice, but you wouldn't believe what else it's good on! Duck, geese, caribou, moose, salmon, smelt, grizzly bear, porcupine, & arctic hare, to name a few. Talk about converts!! I have to bring back half-a-dozen cans every time I visit home just to pass out to Native Alaskan friends & visiting teachers to my village. Yum, that would make good Cajun rib-eye! I'd also toss it in my red beans and rice, gumbo, jambalaya, bean soup...ok, I guess I just love Cajun food. Okay, now for my normal voice. I would love to try some more of the Slap Yo Mama spices. Having migrated to NC since Katrina I can tell you we need some more Cajun spice up here. Miss a lot of ingredients this way including some good ole Cajun spices. Out here in Dallas, I have to make my cajun food if I want it to be any good! Does Slap Ya Mamma go well with BBQ'd Rattlesnake? I wanna Slap Ma Mama for that reduced sugar pumpkin pie she made me. Pure nastiness it was. Anyhoo, I'd love to try some cajun fish (only ever had cajun skrimps). I have in fact slapped my own mother because of the flavor of this special seasoning which I hold close to my heart. After said slap, the woman whom spent hours in labor giving birth to me all those years ago tasted the holy container of goodness herself and gave me a look as if to say,"I deserve atleast one more." My brother who lives in Houston LOVES this stuff and kindly bought some and sent us some. We sprinkle it on fresh avocados, on our eggs, on our meats...everywhere. The sad thing is we can't buy it here in AZ, so this would be a wonderful treat. I love cajun food and tried to cook my way through a Paul Prudhomme recipe book in the 80's. My husband was getting too fat so I stopped. You can contact me via facebook or my own blog if I am the lucky winner! Slap Ya Mama is the best! I'm a transplanted Louisianan who was given Slap Ya Mama as a gift from someone who found it in a gift shop in Missouri! I had it shipped for a while, but finally found it in a grocery store here in Oklahoma. Makes stuff so good it makes you want to "Slap Ya Mama".! it feels weird to know that i won't "accidentally" win this..
What I love about cajun food is having it cooked by my Louisiana native chef husband! He cooked a Turducken for Thanksgiving for our friends here in San Diego, CA using SYM and it was a HUGE hit. We are both natives of Louisiana, living in San Diego and remain advocates of good ole cajun cooking. My sister from Prairieville got me hooked on SYM & I have gotten a few San Diegans hooked! I think we should win since we can't find the seasoning in California and we'll need the spices for our traditional Christmas Gumbo! Angela Bankston here again... If I win, you can contact me via email: abar56@yahoo.com or I'm a Slap Ya Mama fan on facebook! I'm amazed at the comments from so many people who don't live in Louisiana. Awesome! Once you've been there, Louisiana is always in your blood and heart (and stomach) no matter where you live! Honestly, I have never heard of Slap Ya Mama, I love the name and can't wait to try it. I have having a Mardi Gras Party for a friends birthday the end of Jan, would love to try these in the food I will be preparing! Living in Tallahassee, I get asked frequently if I can cook Cajun food. My response is always the same -- I am a Cajun, so EVERYTHING that I cook is Cajun food! I'll be making a turkey and sausage gumbo this weekend. C'est si bon, y'all! This is the only time slapping your Mama is aceptable...actually, not only acceptable but recommended...."Here's to all the MAMA's who love Slap Your Mama"...it's in the name! One time.... I slapped Boo's mom. Slap Ya Mama is so good, I use it for toothpaste! I like Cajun/Creole food, but I'm not sure how authentic the food I've had is! It's hard to get it authentic up here in TN, but there is a place in our Farmer's Market that's supposed to make pretty authentic PoBoys and I've had one of them. I'm still pretty new to Cajun cooking, but I can't get enough of it! I didn't always like spicy food. Now when I go home to New England, I'm always disappointed by how bland everything tastes. Last year I introduced my family to "Slap Ya Mama" seasoning when I brought it home for Christmas, and now they love it too (well, my own Mama might still be on the fence... but I know my Dad loves it). I'd love to send a gift package up to Massachusetts; I hope I win one! I was thinking I'm ready for some Slap Ya Mama. I sent you some Mama Jambalaya as a bribe. Paul, is Boo's mama me? Were we in Arkansas? Cute name -- I'd love to try it. Shouldn't it be Slap yo mama ;0 Slap some on me. Cajun food is the best! No doubt about it. A nice hot gumbo that's spiced just enough to feel it but not enough to hurt ... mmmmmmm. My wife, Erin, me the Slap Ya Mama people when she was a bartender. She said they were super nice. When I was a little girl I remember having Gumbo at girlscout camp...being I live in Minnesota, I doubt that was very cajun. Last week, I decided to make Jambalaya ( http://cookwithshari.blogspot.com/2009/12/really-easy-jambalaya.html ) My husband had been whining for weeks about how he wanted jambalaya. I made it...and it was so good! I think these seasonings would be a fantastic addition, and I can't wait to try more cajun recipes! I'm thinking it's about time for me to win! I neeeeeed some Slap Ya Mama so I can make a good ole shrimp gumbo and some SYM shrimp! Congrats to Kristen, Cajun Chef Ryan, Megan Landry Champagne, Angela Bankston, and Kate March as the winners of the Slap Ya Mama Cajun Seasoning Giveaway!! Thanks to everyone for entering, and if you actually know me and can track me down, I'm sure I can get you some free SYM from my personal stash even if you didn't win.